Private scout programs allow you to pick the day and program for your troop. Advance registration is required. Programs may be reserved during operating hours and vary in length from 90 minutes to 3 hours. 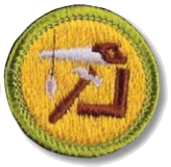 Send an email to programs@manitowoccountyhistory.org, or call (920) 684-4445 with questions regarding Scouts BSA programs. Explore your family history! Learn more about the types of sources used in exploring genealogy. Activities include making a family tree and discussing how technology has changed genealogical research. Prerequisite: Requirement 3 and 4b should be completed prior to attending this program. The documents should be brought along for discussion. Discover the leatherwork trade and its importance in pioneer communities. Make your own project to take home after learning some of the following techniques: cutting leather, punching holes, carving or stamping surface designs, and dressing edges. Requirement 5 will need to be completed after attending this program. Discover the art of blacksmithing! Join our talented blacksmiths in learning about the tools of the trade and make your own project to take home. Prerequisite: Requirements 1-4 need to be completed prior to attending this program, which meets requirement 5d - Option 4: Blacksmithing. Work alongside our carpenter to learn how to use various woodworking tools and create your own project to take home. Meets requirements 4-6. Prerequisite: Requirements 1-3 need to be completed before attending this program. Learn about the Manitowoc County Historical Society and the important role we play in the community. Coordinate with us to volunteer 8 hours of your time at our historic village. Fulfills requirements 7b and 7c. Contact MCHS program coordinator at programs@manitowoccountyhistory.org or (920) 684-4445, to arrange volunteer service.